Indy Criterium - July 9, 2016 - $1,999 WOMEN'S PURSE! Thread: Indy Criterium - July 9, 2016 - $1,999 WOMEN'S PURSE! Please check out our race, the Indy Criterium, started and run by a woman racer. We are offering equal prize payout for the Women's 1/2/3 field of $1,999 and a separate Women's 4 field with a payout of $200. Please join us! indy-criterium for more info. 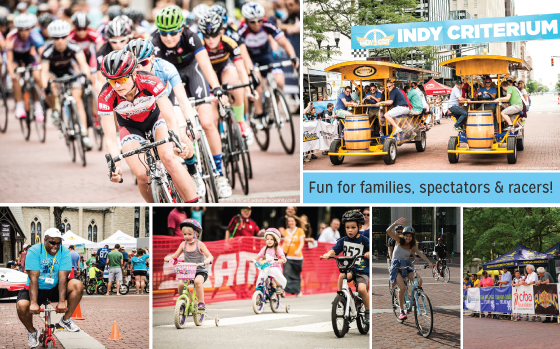 Thousands of bicycle enthusiasts will descend upon Monument Circle in Downtown Indianapolis on Saturday, July 9, 2016 in celebration of the 7th annual Indy Criterium Bicycle Festival strengthened by IU Health. This family-friendly festival is a fun way to enjoy bicycling in the heart of the city while watching world-class amateur and professional bicycle racing. Families and bicyclists will also enjoy many of the activities taking place throughout the day including food and beer vendors, music, expo area, free community rides, free Kids Zone activities, BMX stunt shows, kids and juniors bicycle races and much more! All proceeds from the Indy Criterium benefit Freewheelin’ Community Bikes, a local non-profit committed to enhancing life skills for community youth through bicycles. In total, the Indy Criterium has contributed over $86,000 to Freewheelin’s Earn-A-Bike program since 2010, helping over 900 Indianapolis-area youth earn bicycles of their own. For more information on this free community festival, please visit indy-criterium. F1 - United States Grand Prix at Indy on July 2.... anyone going?? ?